It should come as no surprise that I love living in Overton Square. It's a great neighborhood filled with awesome people and really inspiring and good businesses, and I've lived there (in the 3-block radius at least) since I moved to Memphis in 2009. So I've seen it grow up quite a bit. One place that has been there the entire time, and has stayed consistently great, is Bayou Bar & Grill. I'm pretty sure it was actually the first place I ate in Memphis (as an adult/after officially moving here - the first place I ate when I was visiting to move here was Golden India). I'm almost positive I've tried it all, or at least been at the table and stolen bites of food from people who've ordered things I've never had. I'm a really great friend, y'all. *Also, can we talk about how pretty it's been lately. Like for realz. Bayou is right in the heart of Overton Square, and shares a building/restrooms with Le Chardonnay next door (which I've never really been impressed with - anyone have suggestions for really good food there?). They also have an amazing patio - with misters! *From the parking lot, facing Madison - right behind me is my car (obvs) and the Malco Studio on the Square. *Looking down Madison towards the front door of Bayou. *Bayou is a great place to watch football. They have two large projector screens and at least 7 other TVs, and they play a ton of games. Lots of beads, a ton of sports stuff, a large, nice bar, big open space with lots of tables (I was up on the elevated part where there are 4 tables, but this is only a tiny part of the actual restaurant - I've only had to wait once or twice is how big the place is). And I love Cajun food/music. The music varies, but it was kind of blues-y the day I went. Also, who doesn't love Zydeco bands? I mean. *My friend from Manchester, England, was talking about booking a Zydeco band for her wedding. It's like the international sound of happiness. I mean, they even (almost) had one on Gilmore Girls! *True story: My brother and I used to speak in Sim language all the time. And totally still do. It's awesome. What you don't expect when you go to Bayou, though, is how clean and friendly it is. I recognize that a little bit of dirt is normal, and that some of my favorite places aren't the cleanest in the world, but I really appreciate when a place has a great atmosphere, a totally non-pretentious vibe, is kind of a dive in a lot of ways, but has amazing food and is clean. It's like the trifecta of awesome, if trifecta meant five (pentafecta?). I sat down and immediately knew what I wanted. Like I said, I was really hungry. Like no breakfast, went to the gym at 5 am, needed some food hungry. I ordered my favorite appetizer, the crab stuff shrimp (4 for $6.95), which comes with this amazing spicy Zydeco sauce. *And a Diet Coke. I like to balance my calories out, clearly. Yes, those are jumbo shrimp, stuffed with crab, wrapped in bacon, and then...deep fried? This is health food here, people. Each one is a good two bites. Probably 3 if you're not trying to shove them in your mouth as fast as possible. *Yeah, that's absolutely grease dripping off. It's like flavor juice! I ate all 4 in about 3 minutes. Seriously. I let them cool down (because they are like tiny crustaceans made of lava when they come out) and then just devoured them. The fried chicken po'boy. With spicy fries. If heaven isn't like All Dogs Go To Heaven, it's absolutely like seasoned fries and Gambino's bread at every meal. So this comes with fried chicken, lettuce, tomato, and Cajun mayo. Here comes my only negative thing. My waitress was not great. She was really nice, but seemed to just be having an off day (which we all have!). I asked, really nicely, if I could have the Cajun mayo on the side. Yes, I am that person. But I don't like as much as is usually on there, so it's just easier to get it on the side, and I like it more. So when my food came, she brought me two packets of mayo. I asked, when she came back, if I could have the Cajun Mayo that usually came with it, she said, "Yeah, tartar sauce" and walked away before I could correct her. And then brought me tartar sauce. I didn't see her/couldn't get her attention until she brought the check, so I didn't tell her or ask for anything else, but don't put tartar sauce on a chicken po' boy. I didn't, and put the Zydeco sauce on instead (which ended up being AMAZING) but check your sauces. The other server working that day seemed really enthusiastic, and I've never had bad service there - she just didn't seem like she wanted to be there. The fried chicken po' boy is massive. Like, too much for one person to eat. Especially if they've had an appetizer. I was really really REALLY hungry y'all. I mean, look at the perfect toasting on that bread! The greasy but not soggy breading on the chicken! That tub of spicy sauce just waiting to be used! Look at those fries, nestled so gently next to my sandwich, perfectly complimenting the squishy but firm bread! *Seriously they're crunchy on the outside and soft on the inside and just spicy enough that they aren't just regular fries. They're fries of the gods. Yeah, I at the whole thing. I'm convinced the bread is a huge part of it. I love Gambino's bread, because it crisps up nicely when you toast it like this but doesn't get hard. I don't really even like super crusty bread. When I bake bread, I leave it doughy in the middle. I don't expect that, but bread should be soft enough to eat but firm enough and dense enough to stand up to the fillings. I mean, really. How could I not? My check was about $17, which is a little high for lunch but I did have an appetizer - the prices at Bayou are actually really reasonable, especially for the amount of food. I've seriously never had anything bad there. My friend Ashley loves the gumbo, my friend Courtney said it was the best brunch she'd ever had (and I'm inclined to agree - they have $5 bloody marys, screwdrivers, and mimosas, and the French toast is out of this world). Other favorites are the Bayou Burger, any of the fried shrimp or catfish dishes, and the Blackened Shrimp and Chicken Fettuccine. They also have a daily special during the week. Monday it's Red Beans and Rice, Tuesday it's the Fried Chicken Po' Boy and Gumbo, Wednesday it's Jambalaya and side salad, Thursday it's Cajun Meatloaf with Grits, and Friday is the Fettuccine with a side salad. All for $6.95, all day. And if you tell them you're in a hurry, I'm sure you can get it pretty fast, which makes a nice lunch break. Also, and this is my secret trick, Bayou is not exceptionally busy on Friday and Saturday nights late - we usually go out around 10, so people are done eating dinner, but places like Local, which is very much a stand around or hang out at the bar place, or Bar Louie, or Boscos, are still packed. Bayou is pretty much done with the dinner rush but has a fair amount of people, so we walk down and eat there first a lot on the weekends. Plus, it's right in the middle of one of the most exciting places in Memphis right now. *Gould's is opening right across the street, Delta Groove Yoga is right there, you're right next door to Le Chardonnay, Boscos, right down the street from Chiwawa, right in front of the Malco, and just a few feet from Maggie's Pharm, Local, Bar Louie, YoLo, Boscos, The Attic (which opened today - I can't wait! ), and the new stuff coming in, like Sweet Noshings, Breakaway Running, Cardio Barre, Bikram Hot Yoga, the Ramen and Yakitori Bar, and Babalu. You're also right around the corner from Playhouse on the Square, so this would be a great dinner stop on the way. 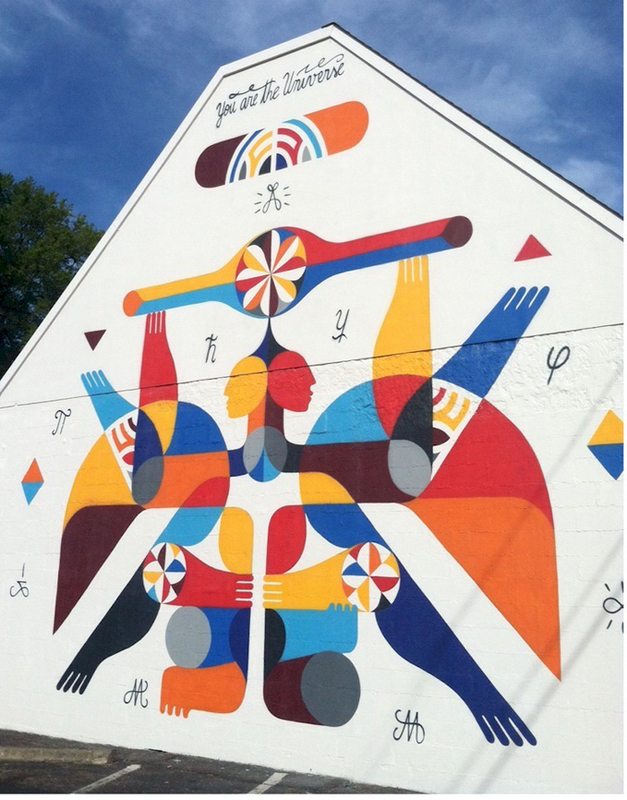 Also you're right by one of my favorite murals in Overton Square, maybe in all of Memphis, the newly finished one by Guillaume Alby (aka "Remed"). I LOVE it. According to the latest reports, Overton Square is at 78% capacity. I'm so excited that this area is growing, but I'm also really happy that places like Bayou are anchoring the Square with their consistently good food, great events, and delicious, delicious bread.